No better thing to enjoy on the weekend. There are few better ways to start the weekend than to take a breakfast favourite we all adore - and add heaps of Nutella. 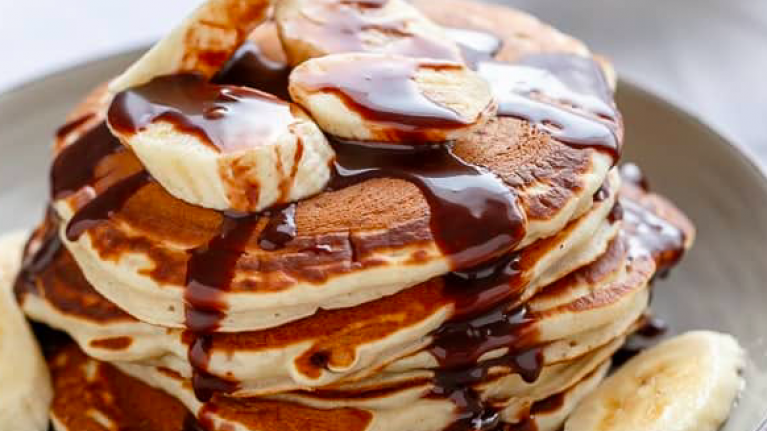 Which is why when we stumbled across this recipe by CafeDelites for banana and Nutella stuffed pancakes, we just had to share. Especially with the option to add the Nutella fudge sauce. And, to make things even better, they are super easy to make. Mash the banana well in a large bowl. Whisk in the egg, butter (or oil), vanilla and milk until combined. Add in the flour, baking powder and salt; fold through until just combined, Whisk lightly to get rid of any lumps. Heat a nonstick pan or skillet over low-medium heat. Pour less than 1/4 cup (2 tablespoons) of batter onto the pan. Before the pancake sets; spoon 1 teaspoon of the melted Nutella onto the centre of the batter and spoon about 1-2 tablespoons of pancake batter over the top to seal in the Nutella. It works best if evenly covering the Nutella in a zig-zag motion. Repeat with remaining batter and Nutella. Serve with sliced bananas and a drizzle of Nutella fudge sauce. Melt the Nutella in the microwave for 30 seconds until warm and slightly thinner. Alternatively, place Nutella in a metal bowl over a pot of simmering water (being careful not to have any water touch the Nutella, or it will seize), until heated through. Mix the milk through, whisking until a glossy sauce forms.